Although Agnes Varda’s directing career began several years before the emergence of the nouvelle vague – and her first feature, La Pointe Courte (1955), suggested the direction to be followed by the New Wave filmmakers as they set out to fracture the traditions of French cinema – she always seemed to be relegated to the fringe of that movement. It’s easy to believe that this had something to do with her being a woman. The New Wave was a fairly aggressively masculine movement – as French intellectual movements tended to be; women in the movies of the nouvelle vague tended to be peripheral to the existential struggles of male protagonists, so a character like Cleo in Varda’s 1962 film Cleo from 5 to 7, wandering around Paris as she waits for the results of a medical test, might be perceived as too specific, too personal, in comparison with someone like Belmondo’s anti-hero in Godard’s À bout de souffle (1960), who stood in for the existential condition of France under the weight of American cultural influences. It was this kind of dichotomy which inspired the feminist principle that “the personal is political”, an assertion that women’s experiences were as valid and important as men’s. In a career spanning six decades, Varda has made a dozen or so features, the gaps between filled with some forty documentaries – shorts and long-form. She has devoted herself almost exclusively to non-fiction over the past twenty years, with that work becoming progressively more personal while simultaneously opening into a wonderfully observant exploration of the world in which she lives and grows old. Beginning with The Gleaners and I (2000), Varda has documented her own aging in touching and revelatory ways, paradoxically through a seemingly inexhaustible interest in other people and the ways in which they live. Gleaners was followed two years later by a sequel, and six years after that by the autobiographical The Beaches of Agnes (2008), in which she looks back over her filmmaking career and her relationship with Jacques Demy. And now nine years beyond that – at the age of 88! 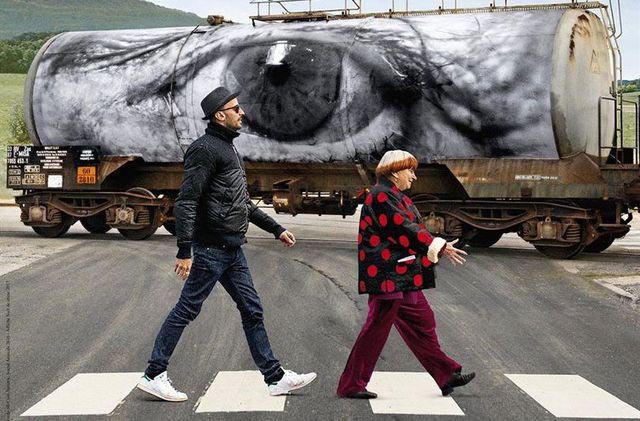 — she has made, with photographer JR, Visages Villages (Faces Places, 2017). 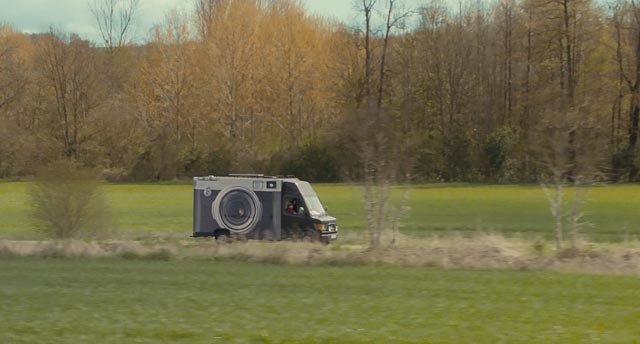 This is a road movie, a story of friendship and inspiration, and an exploration of the richness of “ordinary” lives. Made with lightness, humour and charm, the film is deeply moving in surprising and subtle ways, small moments catching the viewer with unexpected emotion. 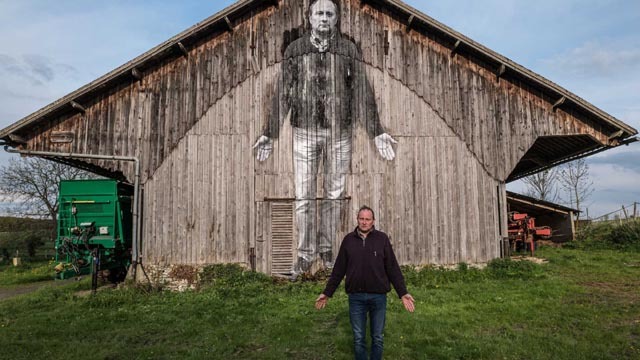 JR is an artist whose practice takes place out in the world; he has a mobile photography studio which he drives from place to place, creating large images of the people he encounters and applying them to buildings and structures, giving these locals an imposing presence in the spaces which they inhabit. 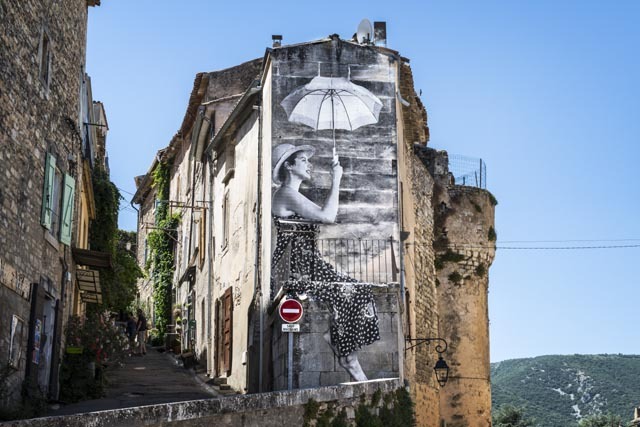 This attracts the interest of Varda, who takes great pleasure in going to new places and meeting new people, and they join forces to travel across France to see what they can find. In a mining region in Northern France, they encounter a woman who is the last inhabitant of a street of houses destined for demolition; this place has been her home all her life and she has no intention of leaving it. 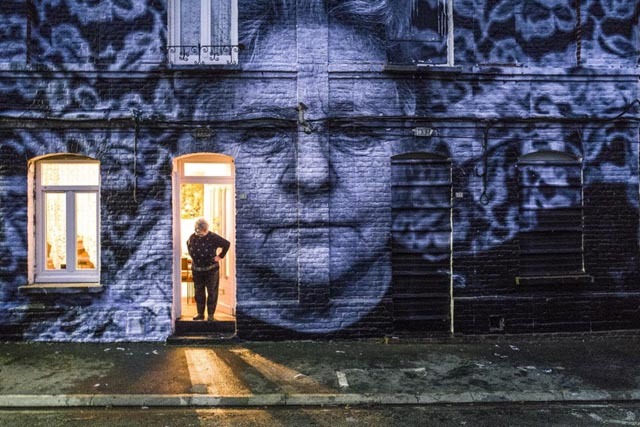 Having blown up archival images of miners which are applied to the length of the street, memories of former inhabitants long since gone, JR photographs this woman and applies the image of her face to the entire front of her house, investing the building with an imposing reminder of the spirit which inhabits it. In another place, they find a village which was abandoned before construction was even finished, the shells of buildings decaying, and they throw a big picnic for people from the neighbourhood and take their pictures to inhabit this place which has never been inhabited. They visit two goat farms, one run by a businesslike man who burns off the goats’ horns to reduce injuries which would undercut the profits to be made from the animals’ milk, the other by a woman who respects the innate goat-ness of the animals, leaving them intact and milking them by hand rather than with machines; Varda and JR leave an imposing image of a horned goat on the side of her barn. And so on – a man who farms 2000 acres by himself with his computerized machinery; the workers at a chemical plant; a woman who works in a small cafe, whose barefoot image towers over the picturesque street; three women married to dockworkers, whose images grace a towering stack of shipping containers … and, touchingly, a young man Varda knew and photographed many years ago, whose image is applied to the side of a concrete German bunker which has fallen from a clifftop to embed itself canted in the beach below. 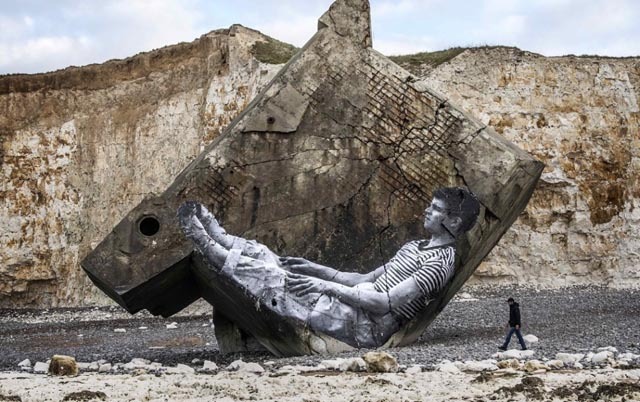 The application of the image has to be coordinated with low tide and when Varda and JR return the next morning, the sea has already erased it; JR comments that his art is by its nature ephemeral. Eyes and the nature of seeing run through the film as a central theme. 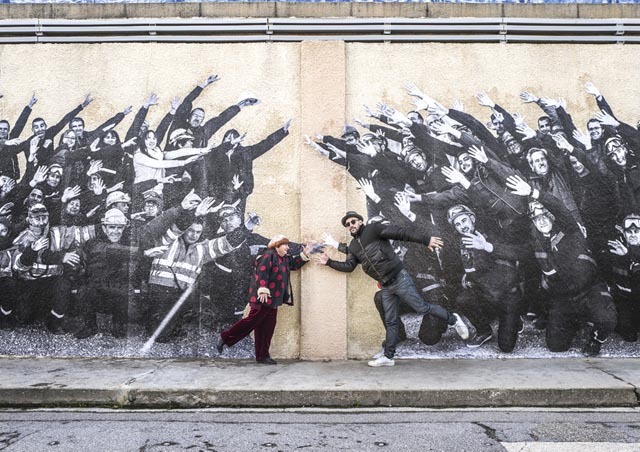 We learn that Varda is losing vision, that she sees the world in a blur (at one point, we witness what appears to be a painful procedure as she receives an injection in her eye); and JR refuses to remove his ubiquitous sunglasses, a point which causes occasional friction because they stand as an obstacle for Varda to knowing him fully. In the film’s final act, she surprises him by taking him to visit Godard, a meeting she has arranged. But when they arrive, Godard can’t be found. Varda is visibly upset; does the hurt she expresses at this apparent slight reflect back to her exclusion from the boys’ club of the New Wave? Or am I reading too much into the moment? JR asks whether the famous director might be deliberately thwarting her desire for a pat ending to their film … but even if this was the case, her emotional reaction suggests something deeper than a playful trick between friends. And so instead of meeting with a legend, Varda and JR end up on a bench overlooking the sea, and as a gesture of friendship and gratitude, JR finally gives her what she has been asking for throughout their journey and removes his sunglasses; and we see him as she does, a vague blur. 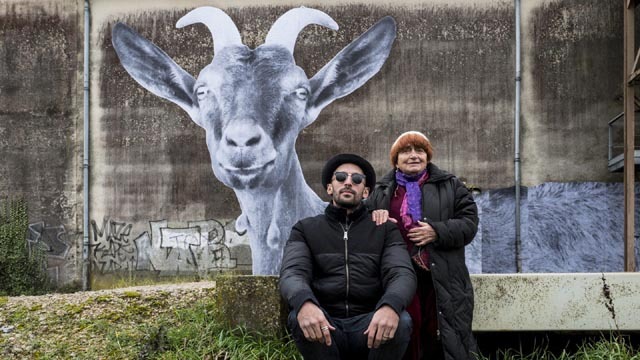 The warmth and emotional resonance of Visages Villages comes from the interweaving of Varda’s on-going examination of her own aging and the exuberant energy of a man 55 years younger than her who has yet to face the deeper ephemerality of life. He invigorates her, while his work facilitates her own passion to remain enlivened by experience; and she in turn gives him a deeper understanding of the life which infuses his art. This entry was posted in Review and tagged Directors, Documentary, French Film. Bookmark the permalink. I am going to look up her films. Thanks for writing about her.